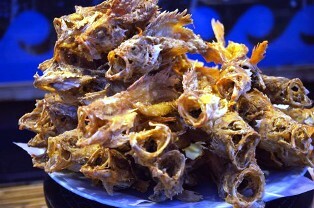 Kasago no Karaage ('カサゴの唐揚げ', is classified into deep-fried food), is known as Deep-fried Marbled Rockfish in English, and 唐扬岩鱼 (Tángyáng yányú) in Chinese. Kasago Fish Karaage, Fried Marbled Rockfish, Scorpion Fish Karaage. Marbled Rockfish, Wheat Flour, Oil. Potato Starch, Ginger, Garlic, Soy Sauce.